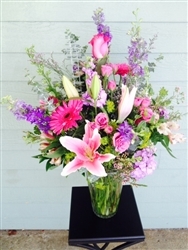 This beautiful mix in pastels is sure to please. Large and full of blooms and fragrance. Stargazers, roses, gerbs, larkspur, mini carns and more! Perfect for an anniversary, birthday, sympathy or for any reason!